With November halfway through and December rapidly approaching it’s time to prepare for Christmas. 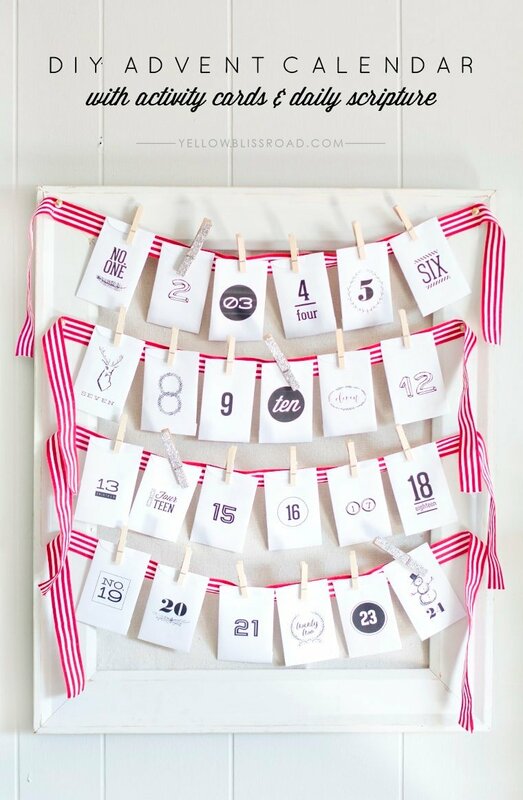 What better way to prepare for Christmas than with this DIY Advent Calendar? 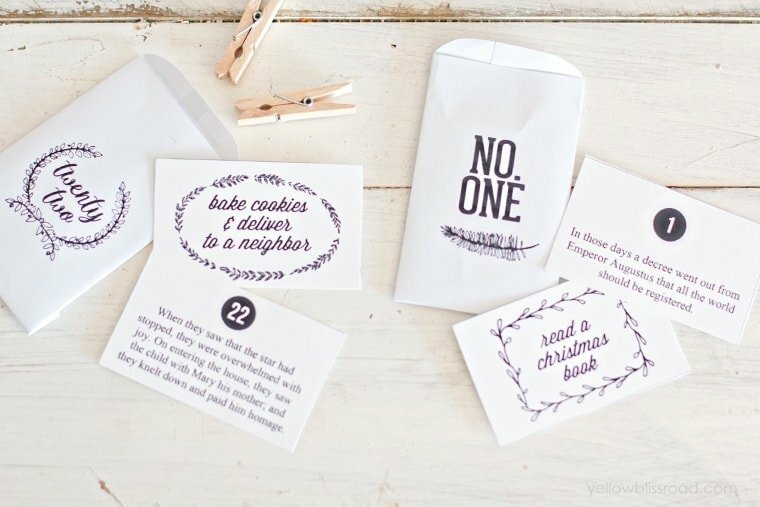 The set is in black and white, so you can dress it up with color to match your holiday decor theme, or print on colored paper. I chose an eclectic theme for the envelopes – they are numbered 1-24 but the numbers are all different styles. 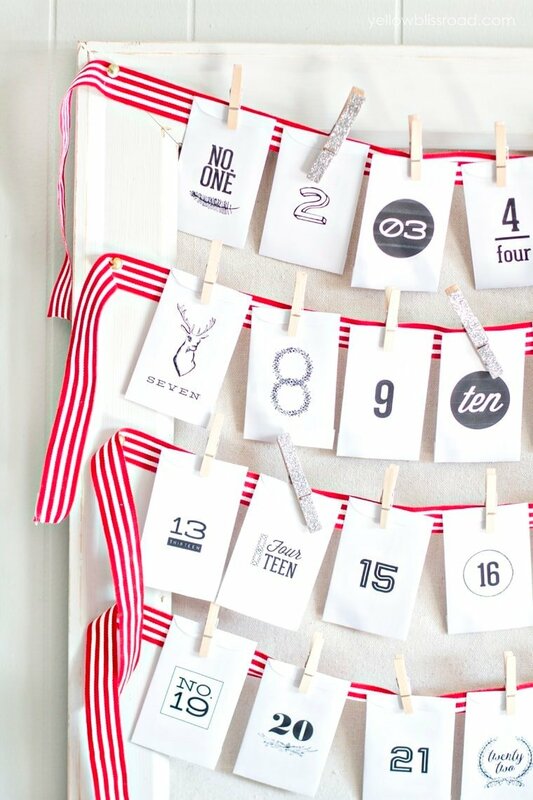 This adorable modern Advent Calendar has three components. You can use one or all of them to fit your family’s needs! This is the DIY part. You just cut them out, fold and glue together – super easy. Directions on how to assemble the envelopes are in THIS POST. There are cards with over 20 different suggestions for holiday family activities and there are also blank cards so you can make up your own based on your family traditions. This is my favorite part of the set. There are 24 cards with pieces of scripture that depict the Christmas story (NRSV). Use them with the activity cards or separately just on their own. WHERE DOES THE ADVENT CALENDAR COME FROM? The tradition of the Advent Calendar began in the mid-19th century, when German Protestants lit candles or made chalk marks on their doors to count the days leading up to Christmas. The first printed Advent Calendar was produced by Gerhard Lang in Germany in the early 1900s. Today, these calendars don’t necessarily follow the Christian Advent season which begins 4 Sundays before Christmas which is often at the end of November. The calendars the you find in stores generally include 24 days, which is December 1-24, because the actual numbers of days during Advent fluctuates from year to year. WHAT DOES EACH DAY OF ADVENT MEAN? Advent is a season observed in many Christian churches as a time of preparation and waiting for the birth of Christ at Christmas. The term is a version of the Latin word meaning “coming.” There are 24 days (some observe 25, with Christmas being the last) and four Sundays in Advent. Printer Paper – A basic copy paper that you probably already have in your printer is all you need for this project. Each envelope prints on a single sheet, so you will need 24 sheets of paper. Glue Stick – If you have a purple glue stick, this is most helpful for gluing the white paper together in just the right spots. I can’t wait to start using this set, and I know my kids will be really excited about it! What a beautiful advent calendar! I was looking to make one for my 17th year old son who’s away in college, this is just perfect as it’s not too childish. It’s finished now and I love the result, thank you for your ideas ? Would love to send you a photo but I can’t work out how! I’m so glad you liked it Matilde! I’d love to see a photo. Maybe post one on our Facebook wall?